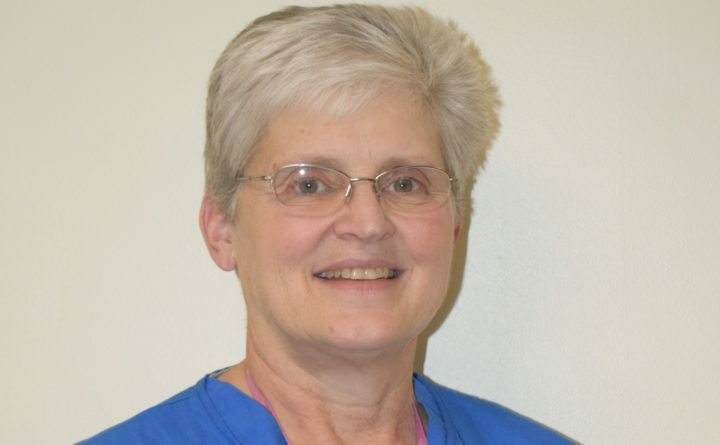 FORT KENT — Robin Damboise, Northern Maine Medical Center’s (NMMC) Director of Human Resources, announced that Judy Dik, CNA and unit secretary for the Operating Room, is NMMC’s Employee of the Quarter honoree. Dik was selected by her peers for the award based her resourcefulness in problem solving, positive attitude and always putting others first. Candidates who are nominated for the Employee of the Quarter award must meet rigorous performance requirements in order to be considered by the selection committee. During her fifteen year tenure at NMMC, Dik has worked in the Human Resources, Nursing Administration, Intensive Care and Emergency departments. Outside her employment at NMMC, Dik is very active in her community as an EMT and as community instructor in Cardiopulmonary Resuscitation. Dik resides in Allagash with her husband, Pastor John Dik. They have two daughters, a nine year old grandson and a second grandchild on the way. In her leisure time, she is an avid gardener and enjoys canning, cooking and yard work. She will receive a monetary gift from Northern Maine Medical Center and the medical staff for her performance excellence and her photo will be displayed on a plaque in a public place of recognition within the organization. To learn more about NMMC’s many services, to make a donation or to learn about volunteer opportunities, visit www.nmmc.org and Like us on Facebook.